In the process of my choice to be healed by the Word rather than surgery (see The Heart of the Matter), I have been purposely scheduling new challenges to declare to the devil that God's Word is Truth. inspiring rise of Monument Terrace commemorates Lynchburg citizens who fought and died in the Civil War, Spanish-American War, World Wars I and II, Korea, Vietnam and present day. At the base on Church Street stands the iconic doughboy statue. 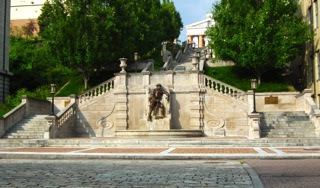 Many other sculptures and markers line the 139 steps and terraces all the way to the top, where the old Court House Museum stands on Court Street. So, when I thought about a day-trip to Lynchburg for one of our cooler Virginia days, I went to the tourism website and saw a picture of this steep hillside attraction. I just knew I had to begin the day there! It's an inspiring and sobering place since the climb up 132 steps has war memorials on each terrace level. Monument Terrace commemorates Lynchburg citizens who fought and died in the Civil War, Spanish-American War, World Wars I and II, Korea, Vietnam and present day. At the base stands a statue and many sculptures and markers have been erected along the way. At the top is the Old Court House which has now been converted into a museum. Along the way I saw an entrance into a small garden with a marker so on the way back down we took time to visit Mr. Elder's Rose Garden. Lawrence Lloyd Elder was a valued employee of the City of Lynchburg for over 34 years. His special domain was gardening and his responsibility the greenhouses where the city’s flowers were raised for use in the parks. 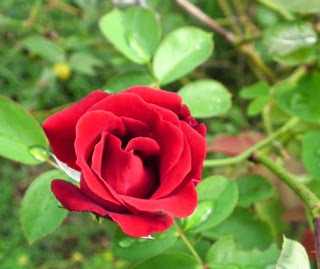 In a remote area he also tended his personal garden of roses, which brought much pleasure to the many city employees in the area. The history and information on each monument and Mr. Elder's garden are described on the photos taken. View photos of Monument Terrace and Mr. Elder's Rose Garden.